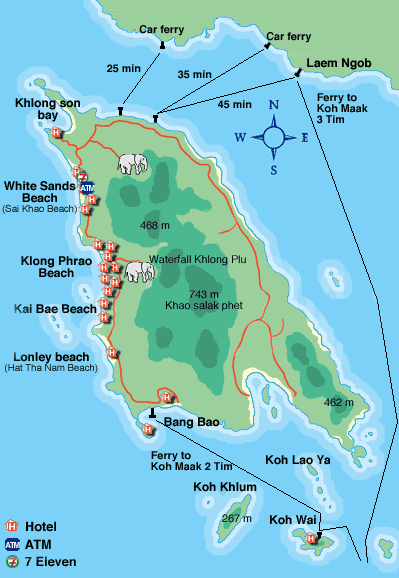 This map of Koh Chang can be used as a fun and useful tool in helping you find your way around Koh Chang. Featured here are the locations of Koh Chang's ferry crossings, main roads, some of the main attractions, and of course Koh changes more popular beaches. The Koh Chang possesses a remarkable beauty with tropical hillsides and a number of scenic waterfalls. The island is rich with flora and forna and has an abundance of bird and wildlife. Popular Koh Chang beaches are White Sands Beach, Chai Chet Klong Prao, Kai Bae, and Bang Bao on the west coast and Long Beach on the east coast.